ThermiTight™ is the name of a novel protocol for subdermal skin tightening. This causes tightening of the support tissues under loose skin, producing a tighter appearance on the outside, similar to how it looked when you were younger! The ThermiRF™ system allows for heating of large sections of tissue for several minutes, rather than a few milliseconds. It has been demonstrated that the dermis must be heated to 42-44 degrees Celsius to stimulate remodeling of the collagen. Pulse-type devices like Ultherapy, lasers, and Thermage, heat the skin or subdermal tissues briefly for only a fraction of a second at each tiny spot where the device was fired on the skin. There is no measurement of the actual temperature to assure that the “sweet spot temperature,” as Dr. Rodriguez calls it, was ever attained, even for that fraction of a second. For ThermiTight™, the ThermiRF™ system is used along with a tiny SmartTip™ thermistor probe, which is inserted under the skin to heat subdermal tissues to a user selected specific temperature. During the ThermiTight procedure, internal temperatures are monitored and regulated by the system computer and displayed for Dr. Rodriguez and assistants to monitor at all times. This allows for safe, prolonged heating of the tissues to the temperatures that produce tightening. There is more precision and safety with ThermiTight™. The ThermiRF™ system is used along with a tiny SmartTip™ thermistor probe that allows internal temperatures to be monitored and regulated by the system computer and displayed for the doctor and assistants to monitor at all times. 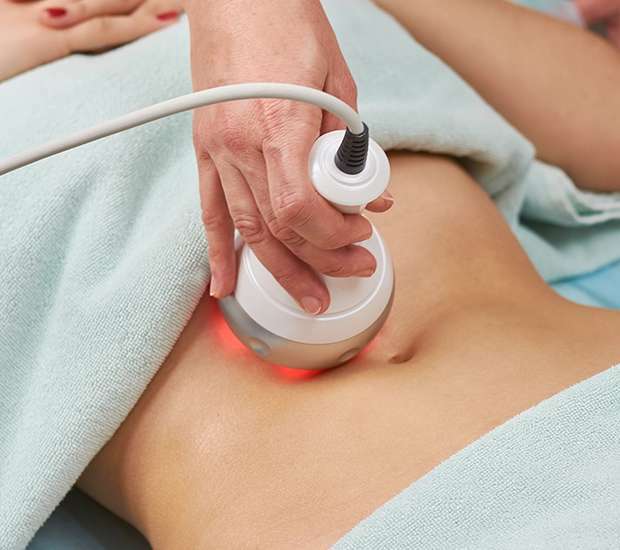 In addition, Thermal Image Guidance™ with a high resolution infrared camera provides Dr. Rodriguez with real time external temperatures, to a tenth of a degree, to ensure precision of the heating effect while maintaining safe skin temperatures. There is more heating of the loose tissues with the added safety of real time internal and external temperature monitoring. A small volume of anesthetic solution is injected into the area to be treated, so that there is no pain like there is with Ultherapy, lasers, and Thermage. The tiny ThermiRF™ SmartTip™ thermistor probe is then inserted under the skin, and the surgeon applies gentle, slow, back and forth movements to heat up the tissues to the desired level. Skin safety is monitored with Thermal Image Guidance™. Most procedures last about one hour. After the procedure, a gentle wrap is applied and the patient may resume normal activities the next day, especially since strong narcotic pain medication is not required. There is often immediate visible improvement, and the final results are evident after 3 or 4 months of tissue remodeling and tightening.